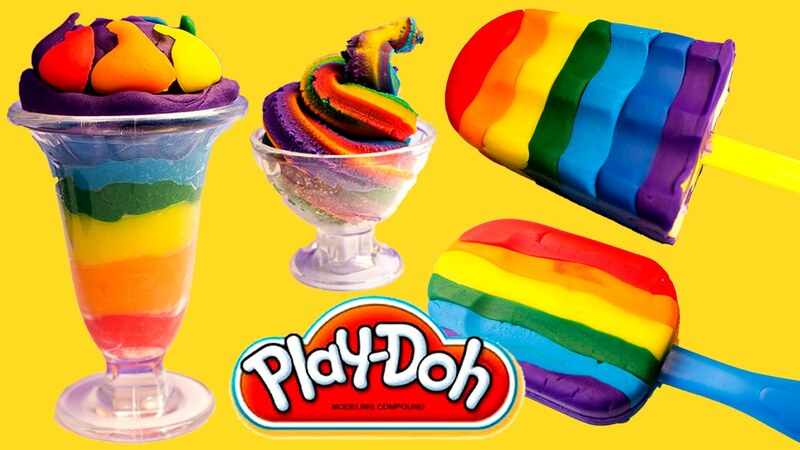 Does anyone else remember playing with Play-Doh when they were younger? That stuff was a child’s best friend. You could live out your wildest six-year old imaginations from the highest chair in the house, while Mom watched out for the four-year old brother crawling around beneath ready to eat up any of the delicious clay that fell to the floor. Of course, it was never actually anything like the picture above. That was a cold, hard, sweet-smelling lie; similar to Play-Doh after it hardened because you didn’t touch it for like five minutes. The real stuff wouldn’t mix without turning into grotesque colors, ruining your idea of a rainbow or multicolored house. Other than that though, it was a wonderful blob of molding clay that you could turn into anything your heart desired. I find bulk to be a lot like unused Play-Doh. I mean, it’s a lot harder to make rainbows and ice cream out of Magic cards, but the core concept is still there. You can mold it into any number of different shapes and sizes to fit the needs of your customer base. While the majority of competitive players don’t really care about the Suture Priests or Jace’s Erasures of the world, we can be thankful that the invisible and silent majority of players really could care less about bulk. In fact, they’re one of the main sources where we’ll be acquiring the recent bulk. 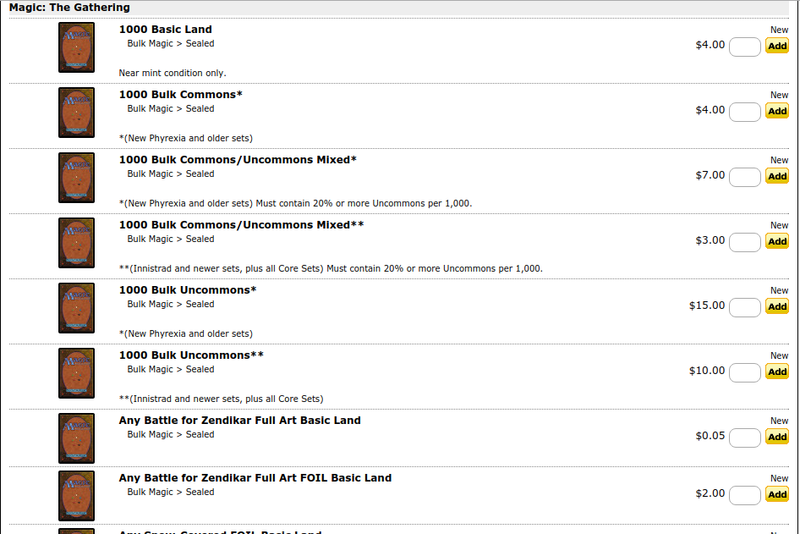 I’ve mentioned this in previous articles so I won’t go too into depth on bulk acquisition this week, but phase one is just putting your name out there in the local scene and being “that one person” who wants to fill their house/apartment with Magic cards. If you’ve been reading my articles for a while, you know what I’ve been molding my bulk into. I pick through it for the Rancors and the Blood Artists, even snatching out the Ajani’s Pridemates. 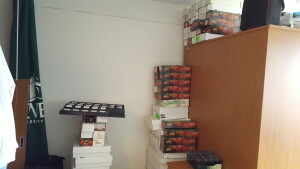 Those were alphabetized, while the remains were randomized and packed into 1,000 count BCW boxes (Disclaimer: These actually hold approximately 1,200 cards, so don’t pack them to capacity if you’re trying to sell 1ks). I sell those out of my small display case in town for $7 per thousand, and continue to be surprised at their enduring popularity. 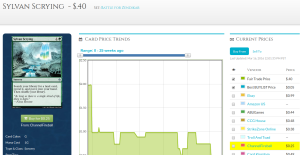 This method certainly doesn’t take a whole lot of effort, but you can scale the amount of money you squeeze from a thousand cards up with the amount of effort and time you want to put in. For those of you who are true masochists grinders and actually enjoy sorting cards by set/alphabet, there are a few select buylists out there that will pay you handsomely for your Netflix+sorting multitask skills. If you’d rather not turn down the dark road of becoming a real “Magic Financier”, then don’t worry. We have some other options available that involve a significantly lower time investment. If you can set up a consistent stream of “old” bulk from NPH or later, certain stores like Coolstuff are willing to pay a solid amount of coin. It’s a lot easier to sort rarity colors and set symbols than letters in the alphabet, so this might be up your ally if you get all of that NM Revised bulk that has been stripped of all its’ dual lands. I’ve also found CSI helpful when I bought bulk that was already sorted by common/uncommon, and I didn’t feel like randomizing it or increasing my volume of 1K boxes at the shop. Once you pick out all the Mindcranks and Vapor Snags, Coolstuff will take the scraps without you needing to put in a whole ton of brain power or effort. While I pick relatively thoroughly, I don’t pick down to the nickel. At least, I didn’t before visiting Card Advantage in Athens, GA. After having a few conversations with the owner, I am now (well, I will be over the summer when I actually have time) a certified Blueprinter. What the hell is a Blueprint? Just one of the most extensive buylists for common/uncommon picks that you’ve ever seen, created by some of the most amazing people in the industry. (Disclaimer 2: Thomas Dodd did not pay me or MTGprice for this advertising space; my high recommendation of them comes only from my own personal experience). While this style of buylisting is certainly not for the faint of heart, you can pick your bulk absolutely bone dry with methods like these, then ship the rest off to CSI. Oh, you didn’t know that you can get almost a dime a piece for common Sludge Crawlers? That’s twice as much as an uncommon Retreat that actually sees play in the Modern deck. If you thought Sylvan Scrying was dead after the reprint, you’re dead wrong. Card Advantage will pay you a dollar for five of these things, which later equals ten more bulk rares in your pocket when you buy someone’s collection. See where I’m going with this? Once you get used to the extensiveness of the buylist and the types of cards that people on Amazon buy, it will only get easier and faster. Let me repeat this for those who are going to scroll to the bottom and write an angry message about how I’m wasting my time sorting cards for pennies on the hour. This industry pays off depending on how much time you put into it. People like Ryan Bushard built a full-time job out of bulk, and there are some people out there who actually enjoy sorting cards. If you want to go out and find the next underpriced Shadows Over Innistrad Standard staple, I think you clicked on the wrong article. Am I going to be spending the next week working on my Blueprint with the 150k cards in my dorm room? No, I don’t have time for that. I will, however, use my last summer break before starting graduate school to grind value out of this, learn the .03 cards to pick, and practice speeding up the process of set sorting/alphabetizing while watching Netflix or professional League of Legends streams. While the remains that didn’t get Blueprinted won’t be up to par to be sold as 1k boxes in my display case (I don’t think my non-competitive customers would appreciate if half the cards in the set were missing), those leftover Play-doh droppings can be molded into cash dollars from another vendor like Coolstuff, and be sold as true bulk. No, those are not World of Warcraft cards. 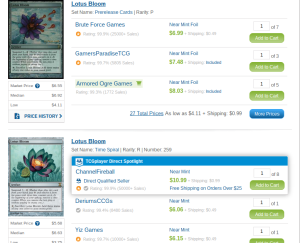 Can someone explain to me why the pre-release foil of Lotus Bloom is the same price as either non-foil? 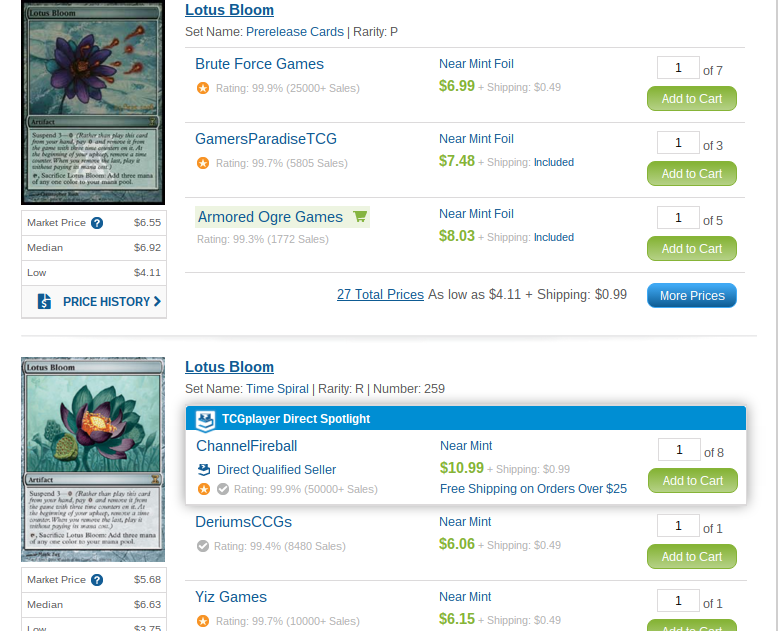 I feel like there are only a couple dozen people in the country who went to a Time Spiral prerelease, and Lotus Bloom certainly isn’t getting another printing anytime soon considering they pumped out Suspend a few years ago and it’s extremely high on the Storm reprint scale. Do people not like the Christopher Rush artwork on the promo? Someone help me understand. As much as I love Christopher Rush and the artwork of cards like All Hallow’s Eve, Desert Nomads or the iconic Lightning Bolt or Black Lotus art – the Lotus Bloom art just doesn’t look very good compared to the regular art in my opinion. The strange little sperm things coming out of the Lotus look weird, like the artist thought ‘it’s called Lotus BLOOM, I have to show clearly what the card is about no matter how strange it looks’. Not sure if you’ve explained this before, but what is your method for randomizing? Since I tend to sort meticulously as I go (or at least attempt to) I guess I find bias when I try to randomize, short of just making piles in the center of a large room and then knocking the piles together and scooping cards out…is there a better way perhaps? 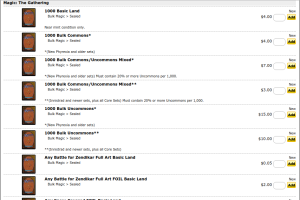 DJ my friend ran into an issue recently, he bought a bulk commons and uncommons collection and it was advertised that the collection had been unsorted and not picked through. Needless to say after after sorting through 10,000 or so cards there was not one single card that wasn’t pure bulk. I don’t buy collections, does my friend have any recourse?? Is there a way to check on who you are buying from? This is one reason I don’t buy bulk collections, I don’t trust people to be honest. My friend has the guy’s name and address, his brother recommended doing some inappropriate but funny things to the guy. Anything realistic that can be done or “stuff happens”? In theory, if the seller knowingly made a false statement of fact about the goods you purchased and you relied on that statement to your detriment, that’s textbook fraud. If we were talking about someone’s representation that they had not removed assets from a company before selling it, when in fact they had transferred away all the valuable assets, the issue would be clearer. 4) Finding a budget-friendly way to go after the seller. So how does one become a blueprinter? Email thomas@cardadvantage.com and ask for the most recent list. Do you have to ship to these buylists? If so how many cards do you need to ship before it is profitable? Where is the actual CA buylist located? I can’t seem to locate it on their website. Thanks! Anyone knows where I could buy those plastic support to sort cards online? 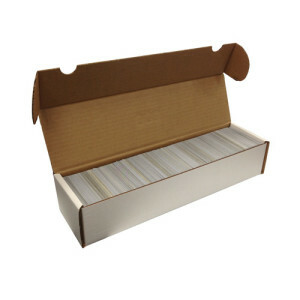 You talking about the card sorting trays? You can get them on Amazon for about 15-20 bucks. I got mine directly from BCWsupplies, you get a discount if you order more. Where do you find the blueprint you were talking about?